Tractor market increased 7.4 percent in the first half in the Turkish domestic market this year over the same period last year. The number of tractor which was sold in the first half this year increased 7.4 percent over the same period last year. Turk Tractor Deputy Director General Irfan Ozdemir said when regarded the traffic registration the sold tractor increased 7.4 percent in the first half in the Turkish domestic market this year. He said Turk Tractor which is featured as foremost firm of the tractor sector was established in 1954 and produced tractors and equipment to utilize the Turkish farmers’ business for 62 years with the vision guiding the agriculture sector. Highlighting the firm achieved 91 percent of the Turkish tractor exports, Ozdemir recorded they had generated value with high technology for the farmers across the world. Emphasizing the 2016 had passed productive as the sector, Ozdemir said, “This year is being experienced abundant, efficient and profitable. This year, precipitations are little bit lesser. Drought happened in some regions of Turkey but in the general meaning the year is passing as abundant and profitable both in terms of agriculture and livestock.” Reminding Turkey was experiencing a difficult and troubled period this year, Ozdemir said, “Turkish economy has the power, capacity, experience and willpower to overcome these problems and troubles. For this reason, we look at positively for the future. We believe and trust future of our country, products, brand, sector, farmers. In this context, we invest and develop ourselves continuously. We try to make up plus values for our farmers. We struggle to facilitate and progress their works. So, we have installed our second plant two year ago.” “We will exceed 60 thousand” Stating they had set up technology centers related to precision agriculture and studies directed towards it, Ozdemir said that they had entered earthmoving machine business. Reminding investments and values they did had made them strengthened and more competitive, he said, “The year 2015 was also a very abundant and productive year. Records were set in tractor sales; nearly 67 thousand tractors were sold. When looked at the sales figures, there is 7.4 percent growth over last year in 1H16. We expect this year would be the same with previous year in terms of the sales. In terms of unit we would exceed the number of 60 thousand units in 2016.” He said there is nearly the number of 1,7 million tractors in Turkey. “The age of 55 percent of existing 1,7 million tractors is between 24-25 years old. They comprise of the tractors completed economic age and high fuel consumption, as well as maintenance and repairing expenditures. According to our statistic, 3 percent of the old tractors are renewed, 1 percent is comprised of our customers who buy new tractors. 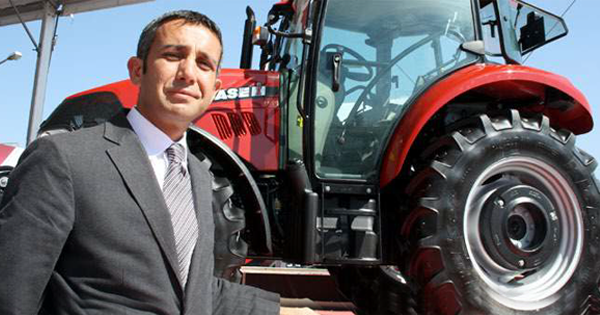 We should support our farmers in order to manage their all activities through swift, effective and productive way with high technological tractors,” Ozdemir concluded.